The 2017 Joriad will be held on January 26 at the Lane County Fairgrounds Livestock Arena in Eugene. 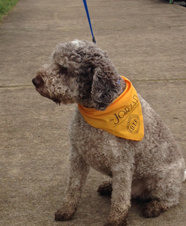 It’s not often I find myself admitting there’s a sporting event I’ve never attended or am not familiar with, but my recent visit to the North American Truffle Dog Championship at The Oregon Horse Center in Eugene was in fact my first ever exposure to this sort of competition. For those of you like myself that might be new to this interesting combination of truffles and dogs, and then to toss in the world championships… well, that itself has got to be intriguing to any sports-minded person. How do truffles, dogs and a championship all come together? And if this in fact is a competition, how does all that work? 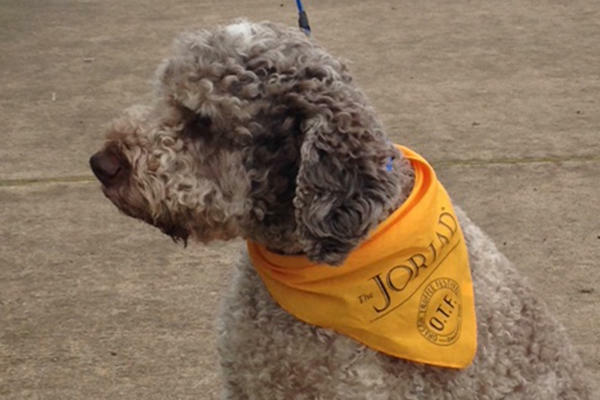 This inaugural event is officially known as the Joriad for the Jory soil that nurtures Oregon’s grapevines, and is one of many events tied to the Oregon Truffle Festival. 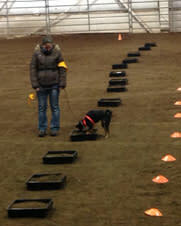 The first day of competition (which I attended) would act as the qualifying event, where dogs would do their hunting indoors in a controlled environment. The top ten finalists would then move onto the second day of competition to the Joriad Field Trial, an authentic outdoor hunt where nature decides how many truffles are available. 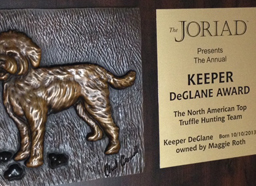 The top field competitor would be awarded the Keeper DeGlane Award, named for a renowned truffle dog with an impressive truffle hunting lineage that can be traced back to Italy. The Joriad was one of the most unique events I’ve ever witnessed. Dogs of every size, shape, and breed compete by sniffing out truffles which are barred in containers of dirt. Each container probably measured two feet square and three inches deep, number about 20 and were organized in two single rows. Each row, or course, is about 20 yards long with two courses set up side by side. Dogs and their handlers are formally introduced by a Master of Ceremonies who includes some interesting side notes and back stories about each contestant and the sport itself. For the beginner like me who knows nothing of the origin, rules, or strategies involved, it was a treat to learn these sorts of facts about the sport and those who participate. Each dog and handler is positioned at the start of each course, patiently but eagerly waiting for the announcer to give the official start. Each round seemed to take three to four minutes, and during this time the dogs were led by leash down the row of containers, sniffing each with all the focus and skill necessary to seek out the hidden truffle. It was intense! I found myself literally on the edge of my seat wondering if the dog maybe just mistakenly passed over the container that held a truffle or if it passed by empty containers that were simply… truffle-less. I didn’t know what to do. Should I shout out “No - go back! I’m sure there’s one in the container you just walked over!”, or do I remain silent and be confident they would accurately determine each containers contents. My inexperience in being a spectator to this amazing event was weighing heavy on me. I was a sports fan watching a sporting event I knew very little, or nothing about. Yet I was impressed with each competitor’s skill and the overall competition itself, but wasn’t entirely sure how to react. I quickly realized these are highly skilled and well trained four legged detectives who completely and fully enjoy the act of smelling out buried treasures we call truffles. Even if I knew what I was talking about I highly doubt these dogs would pay attention to someone like me. Just as animals can sense fear in humans, these dogs could sense the rookie in me. As each round progressed it was exciting to see the elements of the event become clear and I actually started to feel like I was beginning to understand a little more of what I was watching, or at least I thought I was. As a dog seemed to locate their prize within the container (usually by digging down using their paws to move the topsoil), the handler would notify the official standing nearby, who then walked over to the container and confirmed an accurate find, or not. When it was a confirmed find of a buried truffle, the official or judge would then pick it out of the dirt, raise it above their head and shout out “truffle!” at which point the competition would continue until time had expired. A fun aspect of the event was that following each round the dogs and their handlers/owners would make their way out of the competition area and walk through where many of the spectators were located. The enthusiasm of these amazing animals and the relationship they have with their owners was inspiring to see. I love dogs, so of course I was out in front of each and every one as they made their way past the crowd. Proud owners and their happy dogs with tails wagging was all everyone needed to see to bring this sort of event into perspective. The championship was a great event with every participant putting forth their best effort, but it was also a really remarkable competition that I had never realized and was grateful to see firsthand. Now when I think or hear of truffles I’ll always have in my mind these fun and overly excited dogs who use this food that us humans consider a delicacy as a reason to dig around in the dirt and get a little muddy. About the author: A way over the top sports enthusiast, Mike is the Director of Sports Sales and Development with the Eugene, Cascades and Coast Sports Commission. Arriving in Eugene by way of UCLA, Mike manages to keep his Bruin identity even in Duck country. 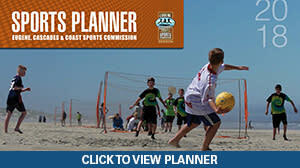 On top of his position with the Sports Commission, Mike is also the Director of the Oregon Volleyball Club and coaches the University of Oregon Women&apos;s Club Volleyball team. When those rare free moments in his schedule do occur, Mike enjoys running, swimming, and almost any kind of activity or competition that breaks a sweat.